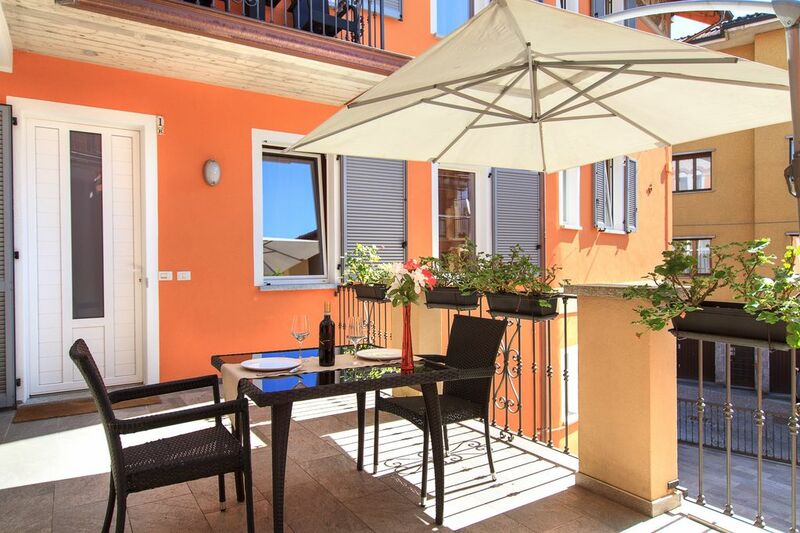 La Lombarda is a newly renovated building of four rental apartments. Each beautiful apartment has a modern kitchen, luxurious bathroom, air conditioning, WiFi, and TV. The building is directly in the center of Stresa, just steps from Piazza Cadorna, boat docks, train station, restaurants, bars, and shops! Each apartment has one bedroom with a queen-sized bed. A queen-size sofa bed is located in the living room. The apartment has a new fully equipped kitchen, bathroom with shower and a washing machine, digital TV, and free Wi-Fi. Air conditioning, heating and Wi-Fi are included and are automatically controlled from the apartment. Although a car is not necessary, as all is easily reachable on foot, there is ample public parking outside the building. Transfers from train station or airports can be arranged if needed. A bread shop is just outside the door. The supermarket is one minute away. So are the restaurants and shops in the piazza. This is in every way a perfect location! Very comfortable unit. Great location. Great hosts. Loved this unit in Stresa. Excellent location just a short walk to the main old town and waterfront. Quiet area. Quiet well appointed unit. Clothes washer was very welcome. Extremely comfortable bed and sofa bed. Lots of closet space AND hangars. Nice big bathroom with full size shower and beautiful tile work. Nice windows let excellent light and air into unit. Comfy patio area just out front. Sits above a great restaurant (Osteria mercado) (lots of gluten free options and fantastic owner/staff that are very helpful). And a short walk to another fine eating eatablishment, Osteria degli Amici, also with gluten free options and great staff). Grazie for your review! We're so happy that you enjoyed the apartment and your vacation in Stresa! We're glad that you found it comfortable and convenient, and we agree; the restaurant Osteria Mercato is wonderful! We wish you many more happy travels! Stresa is a great location to base a holiday and this wonderful apartment is close to all facilities including the boats for travelling on the lake. Clean large modern facilities with first class bathroom and comfortable settee, separate bedroom and large fitted wardrobe. Everything we wanted was available with free local parking in the Piazza. Great support from our host Dana - nothing too much trouble. The restaurant Osteria Mercato which was in the same apartment building was exceptional. Thank you for this review and for sharing your thoughts on the apartment. The feedback is very helpful to us. We are very happy that you found the apartment to your liking, and we agree -- the restaurant is very good! We wish you many more happy travels! We had a lovely relaxing two week break here. Very stylish, attractive and comfortable apartment. In central Stresa so very near lake, shops and restaurants etc but amazingly quiet. Great air conditioning too. Hosts were very thoughtful and we had absolutely no problems the whole stay. Thank you for a wonderful holiday. Thank you for staying at La Lombarda, and for your helpful review! We're so glad you had a wonderful holiday in Stresa; please come again! Great convenient location, modem and spotless. Lovely one bedroom apartment, completely renovated building. Large bathroom with large tiled shower. Tiny kitchen, small fridge, no freezer. Oven Is combo microwave/convection. Steps to lively square and 5 minutes to lake front. Front patio is shared with neighbors. Owners were great, even drove us to the train station saving us a walk with heavy rolling bags. Very responsive and helpful. Bed is very soft and low to the ground. Otherwise wonderful stay in Stresa! Thank you for your review and feedback. It will be very helpful to other travelers. We're glad that you found the apartment good for your stay in Stresa and that we were able to make your vacation easier. Thank you for the review! We're so glad that you enjoyed your stay at La Lombarda, and happy we could help you make good memories here in Stresa. Worked perfectly for our stay in Stresa. Owners were friendly and responsive to any request. Thank you so much for staying with us, and for your review. We hope to see you again!